New Year means new you! Now is the best time to buy your beauty and travel essentials online. Stay fresh and pretty by getting yourself a L'Oreal Paris Pure Clay Mask for only Php 319.20 and a Nyx Liquid Suede Cream Lipstick on flash sale at Php 230. Plan your future travels in style by getting a Jansport backpack at Php 1,450 which comes in various designs such as white leopard, vintage vacation and sweet nectar. Prepare for your Chinese New Year celebration at home. Enjoy listening to your new year playlist with the JBL Clip 2 Portable Waterproof Bluetooth Speaker at Php 2,199. Get yourself a Sony DSC-W800 Digital Camera at Php 3,999 to capture every moment of the celebration. Celebrations aren’t also complete without the feast. The Demotech Wide Electric Grill Tray at Php 899 is a must-buy for all your grilling needs. Creating good feng shui is now easier! Shop for items you usually get from Chinatown like incense, lucky charms, feng shui lucky cat, golden wealth pot, red money tree and banguas, and have them delivered straight at your doorstep. Customers also enjoy free delivery for all Metro Manila orders. This 2018, Lazada has also revamped both its website and mobile app to give customers a better shopping experience. So, what’s new? Customers now get to see products, brands, categories, and bundles personalized according to their preferences and shopping interests. The new shopping platform also provides an unlimited scrolling experience allowing customers to enjoy browsing Lazada’s top deals as if they were on social media. Additional discounts are up for grabs thanks to RCBC and PayMaya. Customers who use their RCBC savings MyDebit Mastercard get a Php 200 discount during the Chinese New Year Sale for a minimum purchase of Php 1,500. PayMaya users get 15% off (maximum discount of Php 200) whenever they use the code PAYMAYAFEB for a minimum purchase of Php 1,000 until February 25. It is just the start of a prosperous year with Lazada! 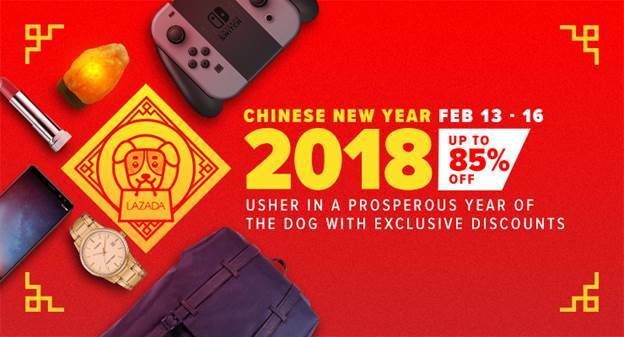 More deals, brands and special offers are up for grabs this year of the dog. Visit www.lazada.com.ph or download the Lazada mobile app for free. PH Gizmo © 2018. All Rights Reserved.